Recorded in several forms including: Atwell, Attwell, Atwill, Attawell, and the dialectals Hatwell, Hatwells, and Hatwill, this is an English surname of pre 7th century origins. It describes a person who lived by a spring or possibly a branch of a river, the derivation being from the phrase "aet wiella", which developed into the Middle English "atte welle", and thence the modern surname spellings. Topographical surname were among the earliest created, since both natural and man-made features in the landscape provided easily recognisable distinguishing names in the small communities of the Middle Ages. The form as Atwill is from Devonshire and Somerset, Attwool is from Dorset, whilst the Hatwell versions are generally from the London area. The name was first recorded in the latter part of the 13th Century, see below, and one Richard atte Wille was recorded in Devonshire in 1333. 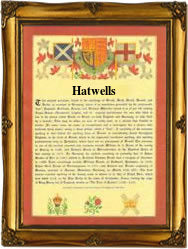 The Atwells were early settlers in the New World Colonies, William Atwell left London on the ship "Falcon" bound for the "Barbadoes" in December 1635, whilst Anne Hatwell, the daughter of Thomas Hatwell, was christened in London at the church of St Andrew's by the Wardrobe, on August 13th 1637, and Mary Attewell married William Elzy at St. Giles Cripplegate, on May 16th 1847. The first recorded spelling of the family name is believed to be that of Gilbert Attewell. This was dated 1274, in the "Hundred Rolls" of the county of Essex, during the reign of King Edward 1st of England, 1272 - 1307. Surnames became necessary when governments introduced personal taxation. In England this was sometimes known as Poll Tax. Throughout the centuries, surnames in every country have continued to "develop" often leading to astonishing variants of the original spelling.